On this page of strongest animal facts you will find interesting information about the Musk Ox (Muskox). You will get a real sense of why this animal is considered to be so strong along with other facts about this amazing species. Kids and adults often confuse the Musk Ox with the buffalo as they are very similar in appearance. This mammal is actually more closely related to sheep and goats than to buffalo. Its closest relative is the Takin which is a goat-antelope that lives only in the Himalayas. Click here for a great selection of Amazon.com books about the Musk Ox. Their hooves are so strong that they can break through solid ice in the Arctic to get to where there is water below. They have been used for centuries to pull heavy carts across rugged terrain. Often pulling weights well over their own body weight. When kept in captivity they must be kept in pens with heavy metal bars; anything less would not hold up to their powerful charge. Musk Oxen are well adapted to survive in the tundra of the Arctic. Their long thick wool enables them to survive in a habitat where not many animals can survive. They are very protective of their cubs and feed them a herbivore diet. Musk Oxen date back thousands of years to the Ice Age where they walked the earth along with woolly mammoths and saber tooth cats. The Musk Oxen eat an omnivorous diet of mainly moss, roots and plants along with the summertime delicacy of flowers and grasses. Qiviut yarn is the yarn that is produced from the undercoat of wool that has shed from the Musk Ox. It is said to be one of the finest fibers in the world, more luxurious than cashmere and much warmer than sheep wool. There are two sub-species of Muskox; the Barren Ground Muskox and the Greenland or White-faced Muskox. There are currently about 150,000 Muskox living worldwide. 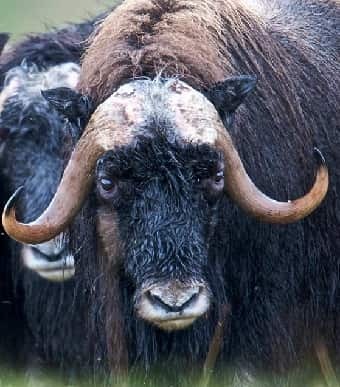 The Musk Ox can be found living in Alaska, Canada, Greenland and Siberia; the most northern parts of both North America and Eurasia. Polar Bears, wolves and humans are the biggest threat to Musk Oxen. Foxes will often eat a carcass, but cannot overpower a Musk ox on their own. Muskox range in size. Males are typically larger and weigh between 400-900 pounds (181 kg - 408 kg). Calves are born directly into the snow in April after an eight month gestation period. The Musk Oxen are normally slow moving animals but can run for short distances at speeds up to 25 mph (40 kph). For protection from predators, the Musk Oxen live and travel in groups or herds of up to three dozen oxen. When there is a threat, the Musk Oxen form a cohesive circle around their young to protect them. The Musk ox are named as such because of the strong odor given off by the males especially during mating season. They urinate to mark their territory and the odor gets trapped in the long, thick wool covering their bodies. The Musk Oxen's biggest line of defense against a potential predator is it's aggressive nature combined with the muscle power in its head and body. It will charge after a threat using its powerful and deadly horns.